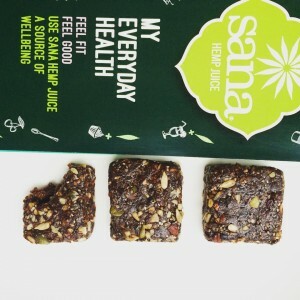 SuperSquare with COLDPRESSED HEMP! A healing raw chocolate energy/protein bar full of superfoods, fruits, berries, nuts and with a hint of fresh lemon. This is the most nutrient dense whole foods source of snack you can find. Whether you need it for sports or simply to spoil yourself.. Or maybe you want a meal replacement when your immune system is suppressed… It doesn’t matter! Completely raw, unprocessed, gluten, dairy, soy and refined sugar free, totally natural guilt free treat high in antioxidants and disease prevention. Food as FUEL, with love, a UNIVERSAL FUEL FOODS creation.